One of the most important tools that chemists have in understanding what’s going on in a chemical reaction is the Lewis structure. Though you won’t see a ton of this in your general chemistry class, even this course will require Lewis structures for determining the polarity of a solvent, which is really, really important. Simply put, you really can’t get by in chemistry without understanding Lewis structures. So, let’s learn about them! 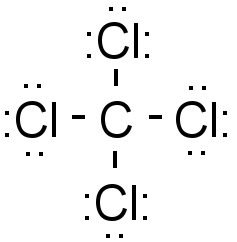 Before we talk about Lewis structures, we really should talk about the various types of representing chemical compounds. After all, if we can’t tell people the important things about a compound, there’s not really any way that they’ll be able to figure out what the heck we’re talking about. Lewis structures: Your new chemical buddies! Now that I’ve gotten all of that out of the way, it’s time to talk about how to draw Lewis structures. 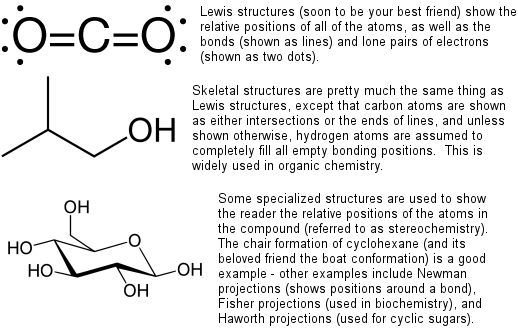 As mentioned earlier, Lewis structures are incredibly important in this class, and way, way more important for actual chemists. If you ever wonder whether something is just being taught to keep you busy, I can assure you that this is not the case here. To make life easy (?) for you, I’ve got a series of steps for drawing most Lewis structures. I won’t lie to you and tell you that the steps are fun, but I can tell you that if you follow these steps, you’ll be a Lewis structures pro. Adding them up, the big total = 4 + 4 = 8 valence electrons. Adding them up, the atoms in the molecule want a total of 16 octet electrons. These are the electrons that will be making chemical bonds in this compound. 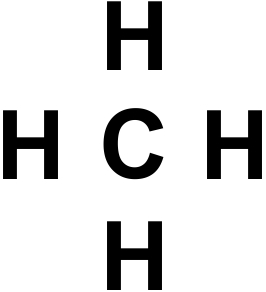 In this case, there’s one carbon and four hydrogen atoms, so draw a big C. If you guessed the wrong element and put an H instead, it really doesn’t make any difference. I just figured that putting a letter on the paper would make you feel like you’re making progress. Which you are. Don’t break these rules, OK? Let’s start drawing some other letters around it. Why not put one on each side? Is the number of bonds right? Yep, we wanted four and we drew four lines. Does hydrogen bond the right number of times? Yep, it wants to bond once each and it does. Does carbon bond the right number of times? Yep, it wants to bond four times and it does. 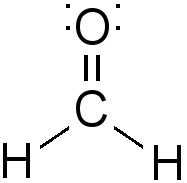 The last step in drawing this Lewis structure is to figure out if we need to add any lone pairs to any of the atoms present. 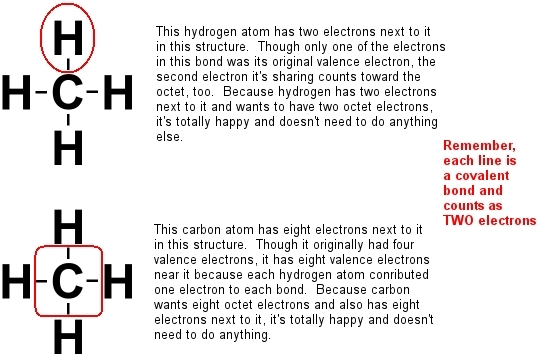 In case you’ve forgotten (or I forgot to tell you), a lone pair of electrons consists of two electrons that are connected solely to one of the atoms in a molecule. They are drawn as two dots, which isn’t really surprising. Because all of the electrons are accounted for, and because all of the atoms have the right number of electrons to satisfy the octet rule, we’ve come up with the right answer! Total number of octet electrons = 8 + 6 = 14. Given that hydrogen wants one bond each and that nitrogen wants three bonds, we’re doing OK so far. Piece of cake! Except… uh… we have a problem. The math we did in steps 1-4 tell us that we need to have four bonds in this molecule, whereas we only have two shown. 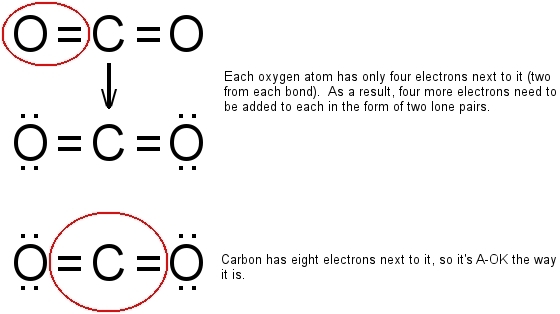 Even worse, oxygen is supposed to have two bonds and carbon is supposed to have four bonds. We’re clearly not doing something right. We can change the ordering of the atoms so they’re connected in different ways. We can turn some of these single bonds into double or triple bonds. It doesn’t really matter which of these you try first, because you’ll find that sometimes one will work and sometimes the other will. However, I’ve noticed that some students, when given a problem like this, will decide that they should just give up and/or freak out. After all, if you don’t know what to do, why should you do it anyway? Here’s why: Because that’s how the world works. If you think that this is the first and only time you’ll ever run into something you don’t intuitively know the answer to, you’re a knucklehead. Instead of feeling like you’re lost, try something to see if it works. Try anything to see if it works. The worst thing that can happen is that you’ll find out you tried the wrong thing and you’ll try something else. If this upsets you, buy an eraser and quit whining! Well, it appears that everything worked out OK. We used up the four bonds we figured out we’d need, each oxygen is bonded twice, and carbon has bonded four times. So far, so good. 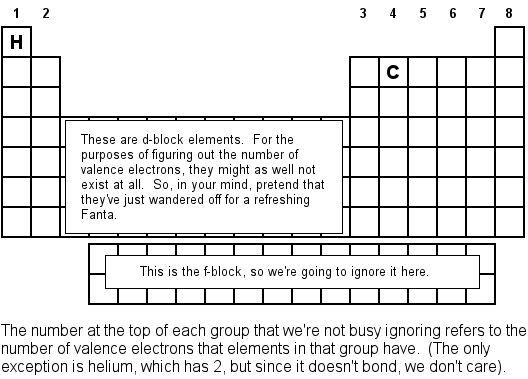 And there’s our answer: Double bonds, lone pairs, and all. You forget the steps I taught you: No worries – if you keep practicing, you’ll eventually learn it whether you want to or not. The number of bonds you calculate in step 4 is a fraction: No worries – do the math over again. The number of bonds is simply too much or too little for the molecules: No worries – do the math over again. You did the math over again and it still doesn’t work: Either you’re still doing the math wrong (in which case you should come back to it in a few minutes), it’s a polyatomic ion (in which case you should read the next tutorial), or it’s a compound with an extended octet (in which case you should check out the corresponding tutorial). No matter which it is, don’t panic. You get the right answers without doing the method in this tutorial: That’s not a problem. While this method works, it’s not the only way to figure out the Lewis structure of a compound. As long as you get the right answer, it doesn’t really matter how you do it! No matter, what, don’t panic. If you practice, practice practice, you can’t help but get it right! 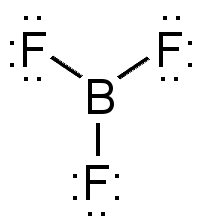 With three bonds, we find that boron bonds once to each fluorine atom – no surprises there. However, boron only needs six octet electrons and not eight, so it doesn’t need any lone pair. (Note: If you drew this molecule with the fluorines at right angles, that’s just fine – the reason I did it this way is because of the magic of VSEPR, which is in a different tutorial). There are more tutorials coming up for polyatomic ions, resonance structures, and expanded octet compounds, so if it’s not up yet, come back in a few days. Unfortunately for you, empirical formulas have absolutely no value in the modern chemical world. You will undoubtedly have to learn that if you have an empirical formula, you can find the molecular formula by dividing the molar mass by the mass of the empirical formula and multiplying the subscripts accordingly. People haven’t done this since the days of combustion analysis, which isn’t done anymore. There is one case where you do see empirical formulas, and that’s in ionic compounds, where the formulas are usually empirical. However, since ionic compounds don’t form molecules, the empirical formula and the molecular formula (such as it is) are identical. Which again makes empirical formulas worthless. All of the examples of structural formulas in the first drawing are public domain images, via Wikimedia Commons. I made the rest of them. Because I’m awesome. For those of you who have been told to cite things incorrectly, the date this was published was January 20, 2015. If you’d like to do it the right way, Google “ACS Style” or the style rules for any of the other physical sciences. Seriously, MLA style? That’s only used in the humanities, and we’re scientists!